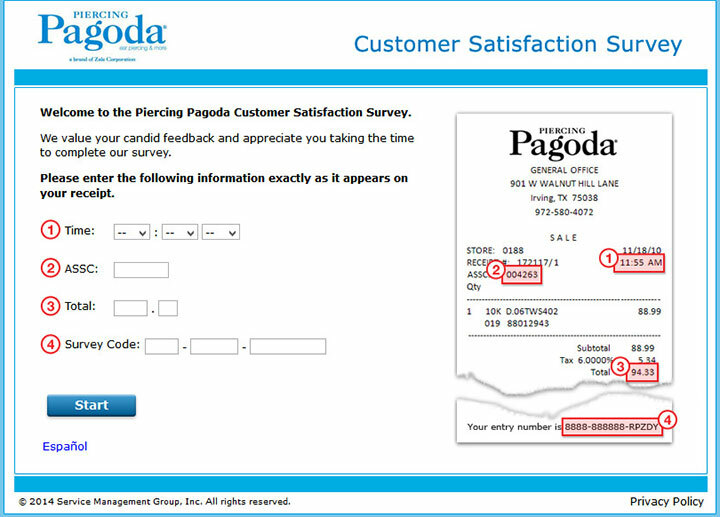 The Piercing Pagoda Customer Satisfaction Survey, found at www.Pagodasurvey.com, is an online questionnaire designed by Piercing Pagoda that helps them understand how their customers feel about their products and services. The information can be used many way, but is generally used to make improvements to customer service. This survey is done online for your convenience. If you take this survey, you can tell the company your true feelings. The questions asked are meant to help you rate the experience and give them an idea of how things are working at each individual store. This allows them to find out what works and what doesn’t. Piercing Pagoda is a jewelry kiosk operating in malls across the U.S. It began in 1969, when Bernard and Bertha Cohen saw an opportunity to meet the increasing trends of ear piercing. In the early years, women of all ages saw the retailer kiosk as a less time consuming and less costly way to have their ears pierced, as opposed to making a visit to the physician’s office. The jewelry kiosk sells mostly 10 and 14 karat gold jewelry, such as necklaces, chains, earrings, rings, and bracelets. From the first kiosk, located at Whitehall mall in Whitehall, PA, the Piercing Pagoda has expanded to roughly 780 locations in U.S. shopping malls. The core business of ear piercing remains, as second and third generations of women visit the kiosk for ear piercing and jewelry selections. The jewelry offering selection increased, when Zale Jewelers bought the retailer in 2000. The objective is to capture greater market share, with affordable, quality jewelry and fashion-pieces women today desire. Have your recent Piercing Pagoda receipt that contains an invitation for the survey. To take the survey in Spanish, click the hyperlink under the dark blue button. Otherwise, proceed to step 3. Enter the time, associate number (ASSC), total spent and the survey code from your receipt. The first two pieces of information will be found at the top of the receipt. The total will be found towards the bottom and the entry number will be found at the very bottom. Answer questions regarding your experience. These questions can pertain to your greeting upon entering, if you were thanked for your business, and so much more. Some questions will ask you to rate something specific, such as if you will tell your friends and family about your experience. There is no special reward for participating in the survey, but you will have peace of mind knowing you helped the company improve themselves.